I’ve been cooking with Teriyaki sauce since, well, I started cooking. When I lived in California, we would pick up this awesome teriyaki sauce from a place called “The Fish King” and used it on just about everything – it was dark, rich, thick, and delicious. When I began to smoke meats, after moving to the East Coast, one of my earliest recipes was teriyaki beef jerky. This stuff was good, and the folks at work would pester me every day until I brought in a fresh batch. I had one co-worker who would come to visit, sit down, and dig into the bag like it was a happy meal. The problem with making this recipe so often was the amount of sauce I went through - It still came from The Fish King and I bought it in restaurant-sized tubs. However, since it needed to be refrigerated, it had to be hand-carried across the country. My mom would frequently fly between coasts, but not often enough to keep my teriyaki sauce supply healthy. The answer was, of course, to try to make the sauce myself. Teriyaki, in it’s simplest form, is soy sauce and sugar. From there, recipes branch out and can include garlic, ginger, sake, mirin (sweet japanese cooking wine), onions, molasses, bourbon, and mustard. I tried just about everything, but ended up reverting to the simplest form: Soy and Sugar. Add a cup of soy and a cup of brown sugar to a small sauce pan – Simmer gently (really – VERY gently – This can easily boil over, and believe me, you will have a mess on your hands), stirring, until the sauce is reduced to your liking. You can easily make more or less, just start with the ratio of 1:1. Some folks like theirs less sweet, and if you fall into this category, decrease the sugar or increase the amount of soy. A quick note on consistency: I like my teriyaki thick, but if you reduce it too much, it will become unmanageable when cool. Reduce to just BEFORE the desired consistency. For years I would add minced garlic, but I have stopped doing that lately in favor of grated ginger. You could do both, of course, but I found a trick that you will want to use: Add the ginger AFTER it has cooked, while the sauce is cooling – It tastes fresher this way. Although this sauce is good on fish and beef, I use it almost exclusively on chicken (although you should try it on Salmon!). Usually, if I am invited to a party and need to bring a dish, I grab some chicken wings (and/or wingettes), some teriyaki, and I’m set – Quick, simple, and yummy. Now many recipes tell you to marinate the chicken in the sauce – Be wary of this, as it can actually turn your chicken rubbery and tough. I usually drop the chicken in some sauce 10-15 minutes before it goes on the grill, just enough to add flavor, but not enough to chemically change the chicken. If you want to use some sauce for dipping, please ensure to save some BEFORE the raw chicken goes in for obvious reasons – You don’t want anyone getting sick. I will, however, give the chicken some quick bastes or baths during cooking, but be sure not to do it too late in the process – You want that sauce to cook properly since it has touched raw poultry. 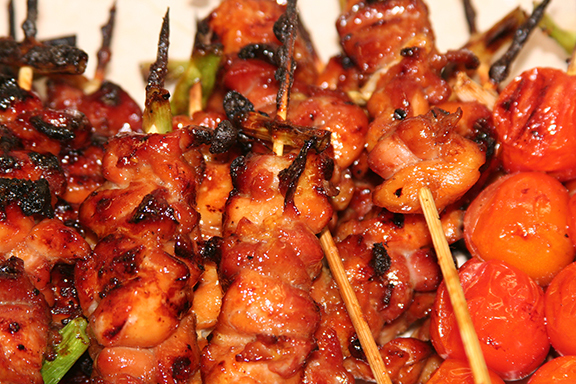 The photo above is of chicken skewers, which are still easy but require a bit more prep time. They do, however, make a better presentation and also help keep guest’s hands cleaner and not so sticky. I’ll take boneless thighs and cut them into half-inch chunks. Thread these onto skewers so they are touching, but not tightly packed. You can even add pieces of green onion for color or to separate the pieces more. If you use bamboo skewers, soak them in water for a half an hour prior to threading, and grill as soon as possible afterwards – You don’t want the skewers to burn. Be vigilant when grilling either recipe, or for that matter ANYTHING using this sauce, as the sugar will burn quite quickly. I like a little bit of caramelization, but there is a fine line here – Just use your head. As usual, feel free to experiment with different flavors in your teriyaki. The basic sauce should keep at least a week, covered tightly in the fridge, but in my house it’s usuallygone long before that. Adding garlic, especially raw, will change that so be sure to smell and taste before you use it. In addition, sweet ingredients, such as mirin, may force you to reduce your sugar, and thick ingredients, like molasses, should shorten your simmering time. Click here for the above recipe! But, but, I love chemically changed chicken! No really. One of my things was to marinate chicken in fresh lemon squeeezin’s and crushed garlic overnight. I was 17, what I did I know? I mean, they cooked the next day. Even so, a quick grilling and they were awesome! Just like Ceviche, except with chicken! The other problem with longer marination of teriyaki is the chicken turns such a lovely shade of grey…..